Los Angeles billboard companies and employees have contributed more than $78,000 to candidates running for six City Council seats in the March 3 primary election, according to the latest City Ethics Commission reports. Not suprisingly, the candidate getting the biggest share of this money is Councilman Jose Huizar, who chairs the City Council committee that is currently considering changes in city sign regulations that could allow more digital billboards as well as legalize almost 1,000 billboards either lacking permits or out of compliance with their permits. Huizar, who is in a contentious re-election fight against former L.A. County Supervisor Gloria Molina, has gotten $31,500 from billboard companies. The other committee member running for re-election, Mitchell Englander, has gotten $6,900 in billboard company contributions even though he is unopposed on the March 3 ballot. These campaign contributions include both independent expenditures and contributions by billboard companies and their employees. The third member of the Planning and Land Use Management committee, Gil Cedillo, isn’t up for re-election until 2017. 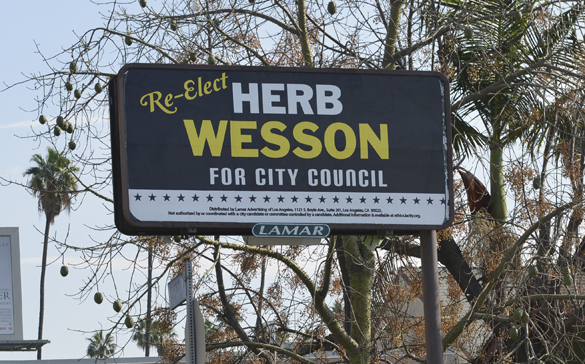 However, Cedillo got $21,000 from billboard companies for his 2013 campaign, mostly in the form of free billboard advertising. In a twist, Martinez’s opponent, Cindy Montanez, got billboard company contributions in the 2013 special election for the San Fernando Valley seat. Montanez is reprising her run against Martinez this year, but hasn’t gotten any billboard company support this time. The biggest spender among the billboard companies is Louisiana-based Lamar Advertising, which has doled out $32,200 to all of the above candidates, according to Ethics Commission records. Almost all of this is in the form of free billboard space. Lamar lobbied city officials for several years for a deal to take down its conventional billboards in exchange for the right to put up new digital billboards. When no deal was forthcoming, the company sued the city for permits to put up 45 of the digital signs, and got a favorable ruling in Superior Court last year. Those permits are on hold, however, while the city appeals the ruling. Other billboard companies and their employees who have put money into council campaigns are Clear Channel, CBS Outdoor (now Outfront Media), Van Wagner, and Summit Media.